Excavations underway at Saltpeter Cave, 1970. Check out the new page about Saltpeter Cave in Newton County. 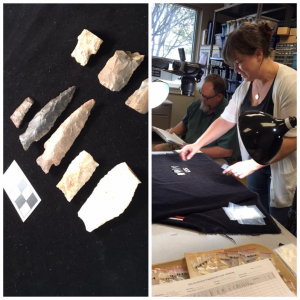 As a part of an Arkansas Natural and Cultural Resources Council grant, we have been busy working on the collections from Saltpeter Cave. The Arkansas Archeological Survey (ARAS) conducted excavations at Saltpeter Cave in 1969 and 1970—the very early years of the organization. Ken Cole, the first Research Station Archeologist stationed at Arkansas Tech (then Arkansas Polytechnic College) conducted two seasons of excavation into this shelter that had been previously visited by the University of Arkansas Museum in 1934. 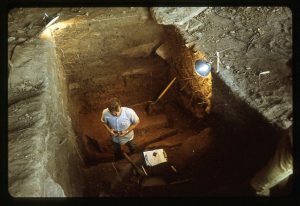 Cole excavated nine test units, the deepest of which contained almost 14 feet (4.11 meters) of archeological deposits representing at least 9,000 years of Arkansas history. This deep, stratified deposit is all the more important to researchers as it is one of the few Arkansas bluff shelters investigated using modern excavation techniques. Thus, unlike the materials from the Dellinger excavations of the 1930s, researchers have detailed stratigraphic records, along with approximately 450 diagnostic hafted bifaces, and 42 radiocarbon samples. Unfortunately, Cole left the Arkansas Archeological Survey shortly following these excavations, leaving this collection curated, but largely untouched for 47 years. Jared Pebworth working with the stone tool artifacts from Saltpeter Cave (Newton County). We have worked to preserve and interpret the material and records from the 1969 and 1970 Saltpeter Cave excavations. This site holds great potential for adding to our understanding of prehistory in the Ozarks. 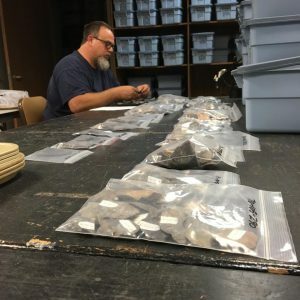 This project has made the Saltpeter Cave materials and records more useful for further work and has preserved the data for future researchers in Arkansas archeology. The first outlined goal was to rehabilitate, reorganize, and inventory the records and artifacts from the 1969 and 1970 excavations at Saltpeter Cave. The records associated with the excavations have been preserved for future research through a combination of scanning and transcription. Goal two of the project was to photograph and analyze a select portion of the collection in order to interpret the site and its importance to the general public of Arkansas and beyond. The deepest excavation unit, Unit E, was selected as the best candidate for analysis and interpretation for this project. The diagnostic stone tools from this test unit have been identified and typed. This information has been entered into a database to aide further analysis, and these tools have been photographed by excavation level. This work has allowed us to identify carbon samples associated with the diagnostic tools. Samples with the best association and most research value have been selected to submit for radiocarbon dating using funds from the Arkansas Archeological Society‘s Archeological Research Fund (ARF) and other sources. Lydia Rees and Jared Pebworth documenting the stone tools recovered from Saltpeter Cave. In addition to the stone tool analysis, all ceramic artifacts from the site have been analyzed. A list of attributes including temper, decoration, and vessel form were recorded for each piece of pottery in the collection. Photographs of a selection of sherds were taken and will be available in addition to the database containing the ceramic data. This ceramic analysis became the pilot project for a region-wide examination of prehistoric ceramics that will be the subject of Lydia’s Rees graduate research. The final goal was to create a on-line exhibit about the Saltpeter Cave site and its unique archeological materials. You can now see the first step in this exhibit–a brief page housed under the “Examples” section of the current bluff shelter website. 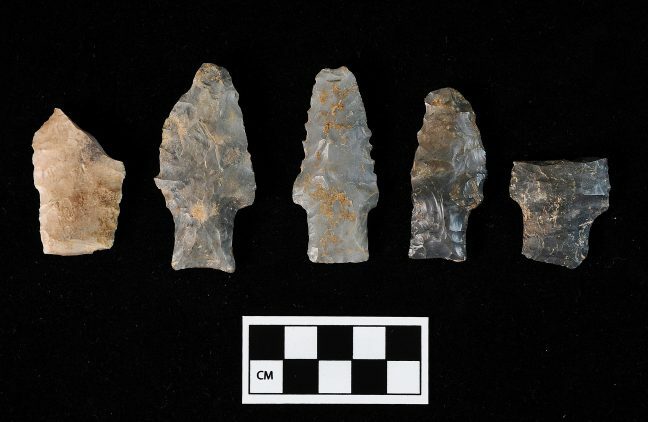 This page includes the history of excavations at the site and information about what the artifacts can tell us about Ozark prehistory, but much more information will be added as we explore this important collection. The next step of this exploration will be understanding the chronology of Saltpeter Cave by analyzing a suite of 6 or more radiocarbon dates that we are currently selecting. Stay posted for more information! Check out the first phase of the Saltpeter Cave webpage here under the Examples Section.